After coming from behind to graft a well-earned point against the high flying Hornets last weekend, our next opponents come in the form of Premier League stalwarts Everton. Can we win some valuable points, at a ground where they’ve proved tough to come by? Our man George Singer takes a look. Tough games in the Premier League come thick and fast, and our next fixture is no exception: a trip up to Goodison Park. It’s well known that our record up there is poor, however it’s staggering when you see how many times in a row we’ve lost. In fact, you have to go back 14 years, and 12 games, since we last avoided defeat there – so all signs point to a difficult day at the office. What should Slav try do as we look to buck this trend? Marco Silva has preferred to use a settled side so far this season, and it has brought some moderate early success to Merseyside. He’s fielded sides in a 4-2-3-1 system every game so far this season, so it’s pretty safe to predict that he’ll continue to do this again against us. Most of the starting XI will pick itself, packing in plenty of Premier League experience onto the pitch, with the only possible exception that the impressive Dominic Calvert-Lewin may rotate into one of the front 4 positions. Most of Everton’s danger will come from wide. Only 22% of their attacks come through the middle third of the pitch – the 3rd lowest in the league – as they prefer to feed the majority of play through their rapid wingers. Their front line is all blessed for pace, and expect any combination of Tosun, Richarlison, Calvert-Lewin and Walcott to run directly at fullbacks. In particular, they used this to great affect at Arsenal, and were able to play the ball behind a slightly disjointed Arsenal defence. There’s no doubt that Silva will again look to employ these tactics against a defence which looked shakey once again against his ex employers last week. In combination with this, in Gylfi Sigurdsson they also have one of the League’s strongest set piece takers. Whilst he hasn’t quite hit the heights of his days as the talisman of Swansea City, where he contributed 23 goals & assists combined from set pieces, his pin point dead-ball ability will be something we’ll need to watch out for. Since moving to Everton from Watford for a staggering £40m in the summer, both fans and journalists had declared the transfer as a waste of money before Richarlison had even touched a ball in a blue shirt. However, the young Brazilian has proved many wrong, and hit the ground running in his second Premier League season. He’s been finding the back of the net with ease, and been chosen in Fantasy Football teams all across the country. Now he’s back from a 3 match ban, and a successful international break, he’s the one I’ll be watching out for on Saturday. In the 5 games he’s played for club and country so far this year he’s scored 5 goals – an impressive return. He’s averaging 0.33 goals per shot, which is way the rate of an average striker (who will score about 0.15). He’s also one of the strongest dribblers in the league, and was Watford’s key creator last year in terms of xG created. All these stats show that he’s not just a one trick pony, and he’s able to contribute to Everton’s attacks in multiple ways. He’s still got a long way to go to pay back all of his transfer fee, however if the 21 year old continues on his current path his future is bright. To be honest, irrespective of the opposition we face up against, Slav’s “To-Do” list is quite simple: find a team that works, and stick to it. Throughout the season so far, we’ve seen nearly every combination of defensive partnership trialled – along with rotation across midfield. Now feels like the time to pick a side, and give the players an extended run of games so they can get to know each other. Personally, there’s a few things I’d like to see in this settled side. The first, and I can’t quite believe i’m saying this, is Denis Odoi. The Belgian has been the unexpected shining light of the defence so far this year, and incredibly feels like the most trustworthy centre back we have in the squad right now. Not unlike Chris Baird before him, he’s come a long way from his days as a reserve utility defender, and looks like he’s found his calling in a different position than we all expected. The confidence and stability he brings to the side will be critical against a rapid Everton attack, who will look to pounce on any mistake. Secondly, I want to see Anguissa become a regular starter. The Cameroonian’s defensive contribution is significant, and every time he’s come onto the picth he’s added stability in midfield with his strength on and off the ball. He can play as both a box-to-box midfielder, or a brick wall anchorman, and it feels like he’s the perfect partner for Jean Michael Seri. Assuming Cairney is still out, I’d like to see us start with the 4-2-3-1 system that we ended the Watford game with, with Seri and Zambo combining well as a midfield pair. Whatever team Slav Bingo falls onto – getting points now is critical. 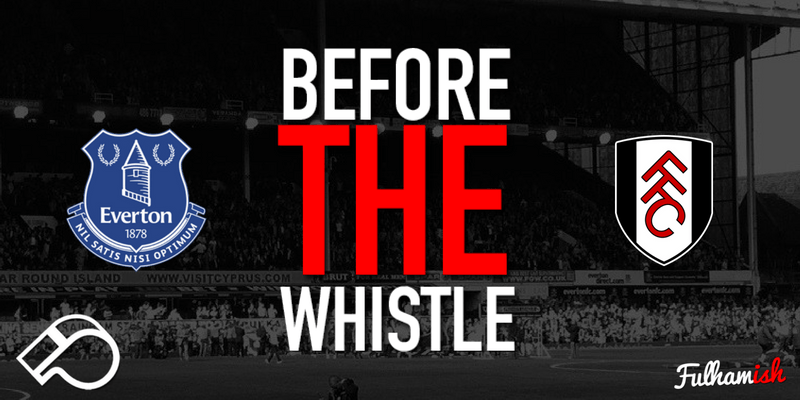 The pressure is building, and the best tonic would be a first points at Goodison park since 1959.